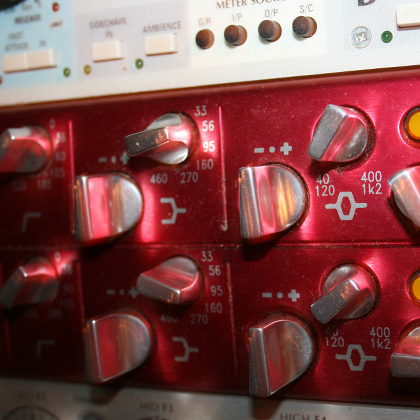 The Focusrite Red 2 equalizer, a Rupert Neve design, was built to model itself after the famous ISA 110 console modules. It includes a pre­amp section, an association found in both the ISA 215 and Focusrite “Blue Series”. While designed mechanically to have features in common with the rest of the Focusrite Red Range, the Red 2 is dedicated only to equalization. The Red 2 is broken down into six sections: low & hi pass filters, low & hi shelf eq’s, and lower & upper midrange parametric eq’s. The low and hi pass filters start with a slope of 12dB/octave and has a 6 position rotary switch that controls the frequency of the filter. The next section allows the user to influence the slope plus or minus 16dB from one of six frequencies chosen on the selector ad hoc. Find Vintage Focusrite Red Units On Amazon! Both the parametric midrange eq’s on the Red 2 are a little more sophisticated. Besides having control over frequency and gain, the Red 2 has frequency selectivity (Q) which controls the range of the frequency adjusted and a frequency command to multiply by 3 the value selected. In addition to this dual parametric range, these two eq bands are partially overlapping. Overall, here at Studio 11, we found the Red 2’s to be particularly useful across individual drum tracks or whole drum mixes because of the clean sound the Red 2 can manufacture. Its also good on acoustic guitars and performing simple subtractive and notch eq duties. Book your session today and find out what the Red 2 can do to your sound. 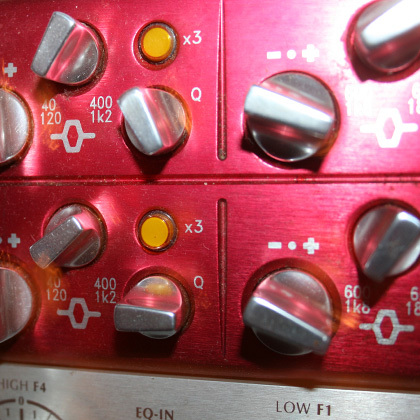 DO YOU WANT THE SOUND OF THE FOCUSRITE RED 2 ANALOG EQUALIZER ON ONE OF YOUR INDIVIDUAL TRACKS?